136 Innovative Health - Summer 2017 worker. As the weeks roll on, these appearances are like actual diaries of progress and optimism. Or, sadly, sometimes of failure. “What can I give them?” asked Judge Barkey rhetorically after adjournment that day. “I urge personal responsibility. I give them schedules to keep, goals that are tough but realistic. I require them to make promises. We write them down in court, and they must follow through. 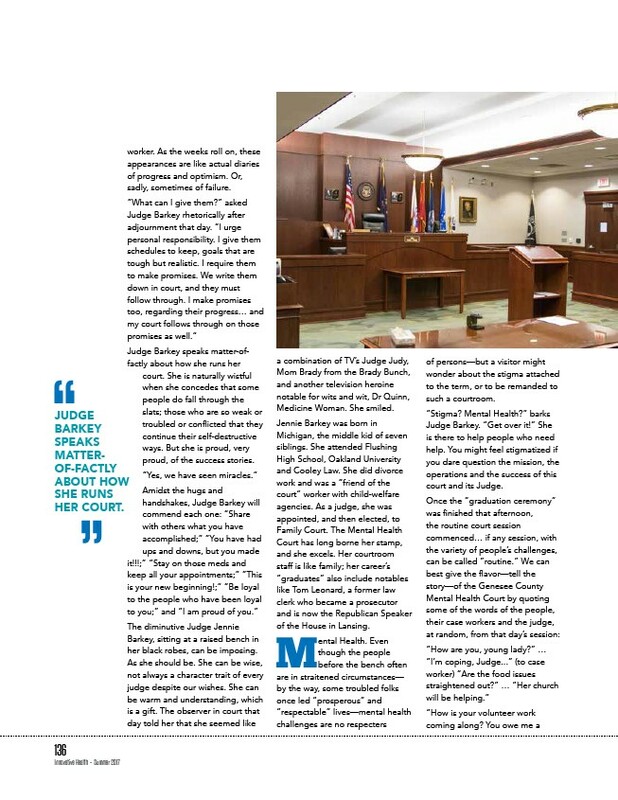 I make promises too, regarding their progress… and my court follows through on those promises as well.” Judge Barkey speaks matter-offactly about how she runs her court. She is naturally wistful when she concedes that some people do fall through the slats; those who are so weak or troubled or conflicted that they continue their self-destructive ways. But she is proud, very proud, of the success stories. “Yes, we have seen miracles.” Amidst the hugs and handshakes, Judge Barkey will commend each one: “Share with others what you have accomplished;” “You have had ups and downs, but you made it!!! ;” “Stay on those meds and keep all your appointments;” “This is your new beginning! ;” “Be loyal to the people who have been loyal to you;” and “I am proud of you.” The diminutive Judge Jennie Barkey, sitting at a raised bench in her black robes, can be imposing. As she should be. She can be wise, not always a character trait of every judge despite our wishes. She can be warm and understanding, which is a gift. The observer in court that day told her that she seemed like a combination of TV’s Judge Judy, Mom Brady from the Brady Bunch, and another television heroine notable for wits and wit, Dr Quinn, Medicine Woman. She smiled. Jennie Barkey was born in Michigan, the middle kid of seven siblings. She attended Flushing High School, Oakland University and Cooley Law. She did divorce work and was a “friend of the court” worker with child-welfare agencies. As a judge, she was appointed, and then elected, to Family Court. The Mental Health Court has long borne her stamp, and she excels. Her courtroom staff is like family; her career’s “graduates” also include notables like Tom Leonard, a former law clerk who became a prosecutor and is now the Republican Speaker of the House in Lansing. Mental Health. Even though the people before the bench often are in straitened circumstances— by the way, some troubled folks once led “prosperous” and “respectable” lives—mental health challenges are no respecters of persons—but a visitor might wonder about the stigma attached to the term, or to be remanded to such a courtroom. “Stigma? Mental Health?” barks Judge Barkey. “Get over it!” She is there to help people who need help. You might feel stigmatized if you dare question the mission, the operations and the success of this court and its Judge. Once the “graduation ceremony” was finished that afternoon, the routine court session commenced… if any session, with the variety of people’s challenges, can be called “routine.” We can best give the flavor—tell the story—of the Genesee County Mental Health Court by quoting some of the words of the people, their case workers and the judge, at random, from that day’s session: “How are you, young lady?” … “I’m coping, Judge...” (to case worker) “Are the food issues straightened out?” … “Her church will be helping.” “How is your volunteer work coming along? You owe me a JUDGE BARKEY SPEAKS MATTEROF FACTLY ABOUT HOW SHE RUNS HER COURT.